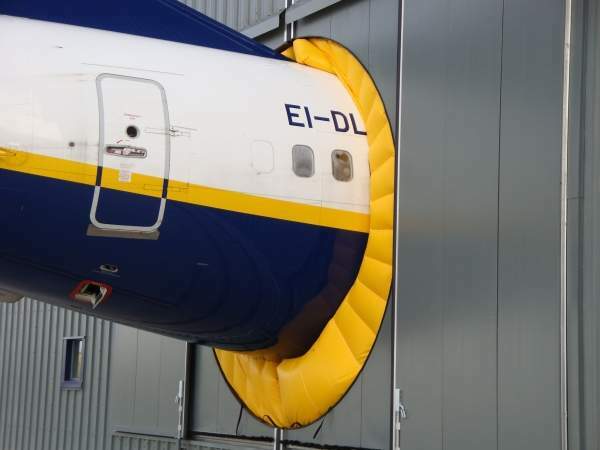 Esavian doors are installed on more A380 and B747 hangars worldwide than any other door system. The most recent of a number of door installations for A380 aircraft hangars is the massive maintenance hangar at New Doha International Airport, Qatar. Developed continuously over many years, Esavian doors have sophisticated control systems to reduce temperature changes when doors are opened and a multitude of safety features. A wide choice of cladding materials is available and Esavian doors are suitable for the harshest environments. In addition to doors for very large hangars, Jewers Doors designs and manufactures doors for hangars of all sizes including those for light aircraft and helicopters. 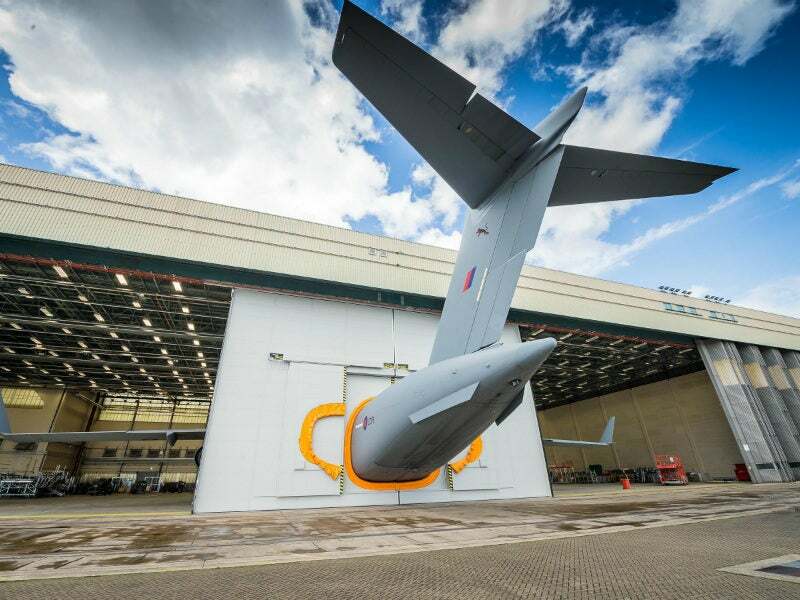 While Esavian doors are often specified for new-build projects, they are equally suitable for refurbished hangars and will give long, low maintenance service. 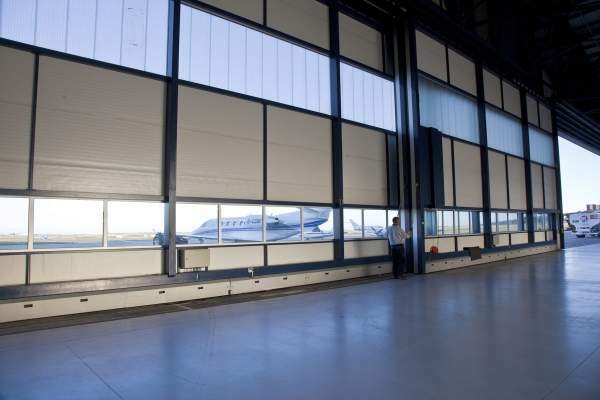 There are no standard sizes or generic specifications for Esavian hangar doors. Instead, each door is designed and manufactured to meet project-specific requirements, such as the size of opening, climatic conditions, wind pressure loadings, architectural features and so on. Jewers Doors has clients on every continent which include commercial airlines, MRO companies, the military, businesses and private individuals. 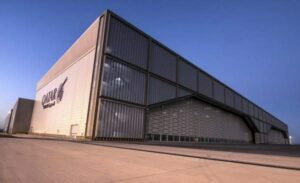 The flagship of the Esavian range, the TYPE 126 straight sliding door has been installed on the largest hangars in the world. 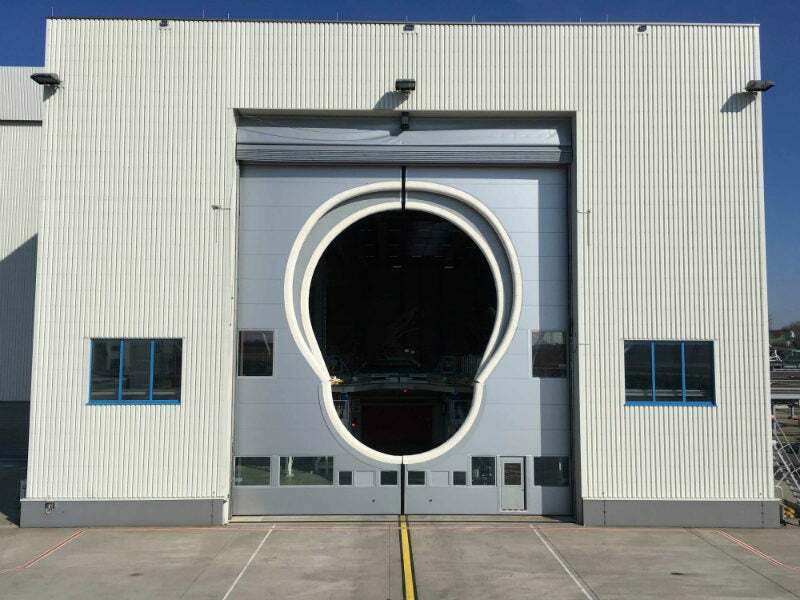 With an unlimited span and heights from 6m to 40m, it is also the most popular and cost-effective form of hangar door available. For these robust, steel-framed construction bottom-rolling, sliding doors there is an unlimited choice of cladding, glazing, colours and configurations. They incorporate full weather-sealing. The Flatfold door is a mid-range folding door from the Esavian line up. This bottom-rolling, insulated, steel door is suitable for openings up to 30m wide by 8m high. It is ideal for large helicopter or medium-sized aircraft hangars. When open, the door leaves fold clear of the opening into small bunching areas, a 30m wide bi-parting door will bunch into under 2m beyond each jamb. 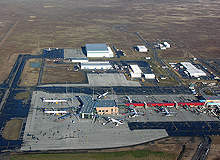 This means there is a full opening width and height without compromising hangar space. The single bottom track is set flush into the floor. Flatfold doors are power operated as standard (hand-wind versions are available) and no load-bearing portal frame is required as the door weight taken by the floor. Inverter control provides smooth acceleration and deceleration during start-up and stopping and because the controls are positioned on the front edge of the door, an operative walks with the door as it is opened and closed. Door frames, mullions and sliding posts are galvanised prior to final finish, which are available in any colour. 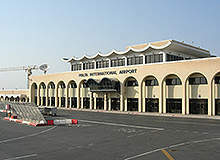 Malta International Airport is the only international airport serving the Republic of Malta in Southern Europe. 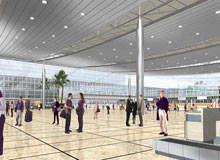 It is located 5km southwest of Valletta, the Maltese capital and is sometimes referred to as the Luqa Airport or Valletta Airport. Jewers Doors will exhibit its range of Esavian aircraft hangar doors in booth 4842 at MRO Americas in Atlanta, US. UK and Dubai-based Jewers Doors delivers world renowned door solutions for all airside requirements. Jewers Doors is exhibiting in Booth 1007 at MRO Middle East on 23 to 24 January 2018 in Dubai. 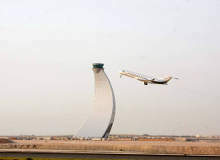 Jewers Doors has been attending the annual Airport Show in Dubai for many years and always look forward to meeting their clients in the Middle East, as well as prospective customers from further afield. Jewers Doors has been attending the MRO Americas event annually for the last few years, and looks forward to attending the show again this year, where they will be showcasing their latest hangar doors and solutions for the aviation sector. 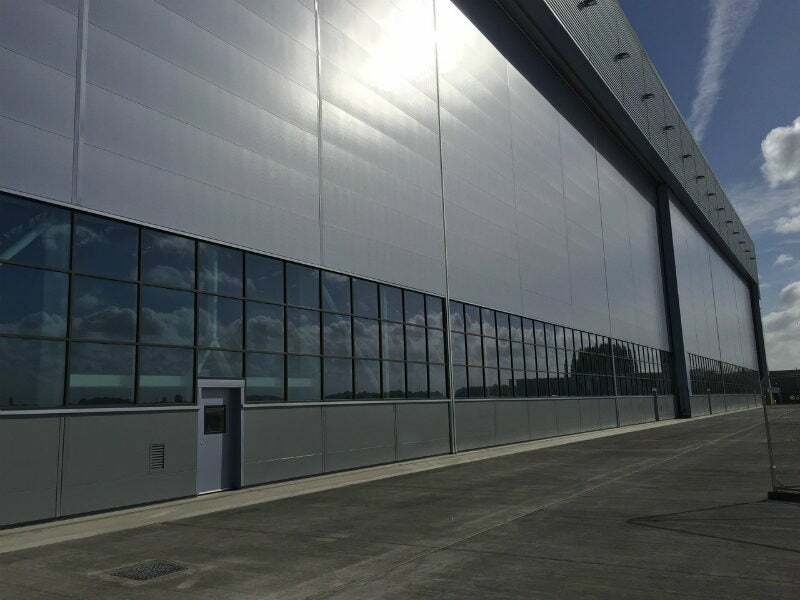 Continuing its long-standing involvement with hangar projects on RAF bases, Jewers Doors has designed, manufactured and installed its world renowned Esavian doors on the new 24,000m² hangar at RAF Brize Norton. From 21 to 23 January 2015, Jewers will be demonstrating at Inter Airport South East Asia. 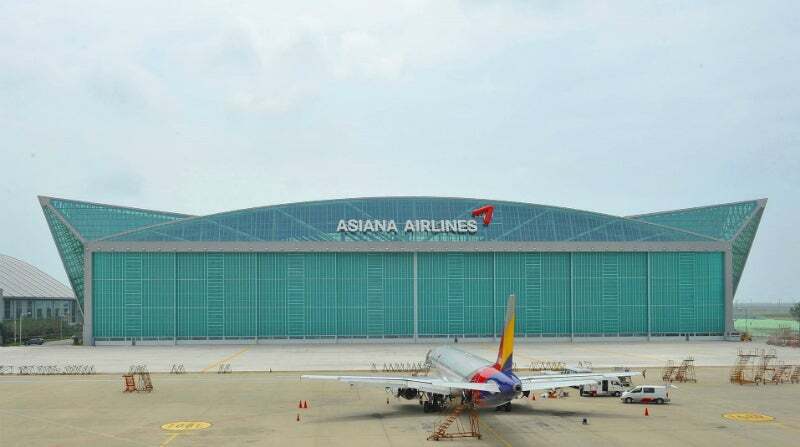 Jewers Doors - the leading supplier of aircraft hangar doors of all sizes around the world - has commissioned their latest set of Esavian doors for the new Asiana Airlines MRO facility hangar at Incheon International Airport, South Korea. 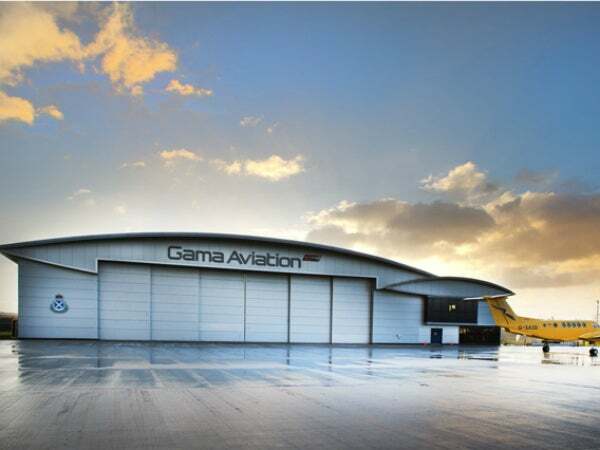 Construction work on the new state-of-the-art Monarch Aircraft Engineering Limited (MAEL) maintenance facility at Birmingham Airport in the UK is well underway with the Esavian doors now installed. 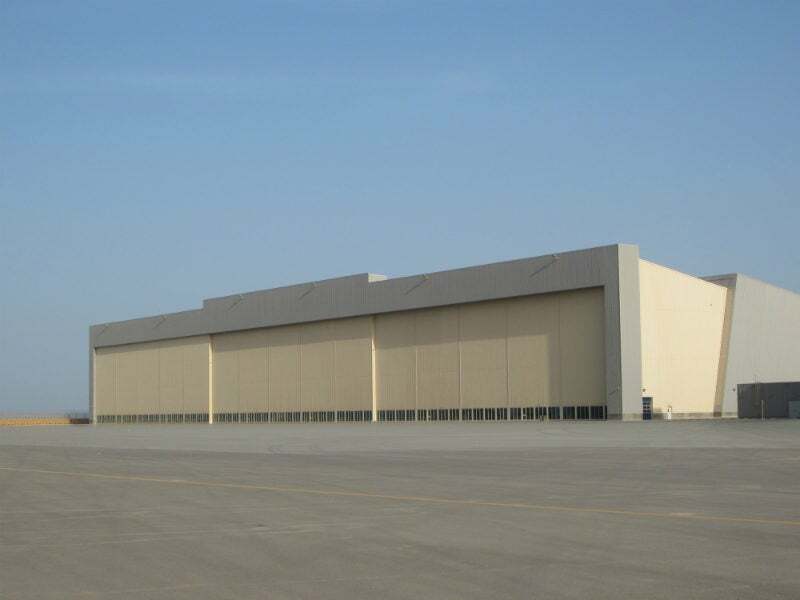 Jewers Doors has supplied its world-renowned Esavian Type 126 doors for the new DC Aviation and Al-Futtaim joint venture executive jet hangar at Dubai World Central - Al Maktoum International airport. The hangar, which can accommodate aircraft up to Boeing 757 size, has doors 62m wide and 13.5m high with a tailgate opening that increases the height to 16m. Specialist insulated sliding and folding door manufacturer, Jewers Doors Ltd of Biggleswade, is now supplying 'plug & play' digitally controlled drives on its Phoenix range of Osprey and Kingfisher doors. The benefits are measurable cost reductions, easier door adjustment and more sophisticated door programming. Jewers Doors is pleased to announce that Ben Pritchard has been appointed as its Middle East Sales Representative. Ben will be based in Dubai and will directly represent Jewers Doors in the United Arab Emirates, Qatar, Saudi Arabia, Bahrain, Kuwait and Oman. He will also monitor a wider geographical territory, including Egypt, Cyprus, Lebanon, Yemen, Syria, Sudan and Libya. Jewers Doors has been contracted to design, manufacture and install a set of its world class Esavian doors for the new Jet Centre, which is being constructed as an executive gateway to the Isle of Man. In a €15m ($20.5m) investment to nearly double its narrow body (Boeing 737 and Airbus A320 families) MRO capacity, Lufthansa Technik Sofia is having a two-bay 5,200m² hangar constructed. 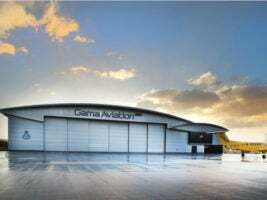 UK-based Jewers Doors has been contracted to design, supply and install its world-renowned Esavian doors for the hangar. UK-based Jewers Doors will supply its latest Esavian doors for a new hangar being built at Hong Kong Business Aviation Centre (HKBAC), which is located at Hong Kong International Airport.